Popularly known as Junk Yard Dog or JYD, Jerome Williams is an American former basketball player and revered fan-favourite who last played for the NBA’s New York Knicks and BIG 3’s team POWER. Williams was first recognized for his remarkable basketball skills on his Magruder High School basketball team. He was then drafted in 1996 out of Georgetown University by the Detroit Pistons, playing with them for over four years and becoming one of their key reserves. It was during his time with the Pistons that Williams was nicknamed Junk Yard Dog (JYD) by Rick Mahorn and Grant Long; appropriately so for his “hard work” and “hustle”. After playing for the Pistons, Williams went on to play for the Toronto Raptors, beginning February 22 of 2001 – something Jerome was so ecstatic about that he drove immediately from Detroit to Toronto after receiving the news. Spanning from 2002-2003 with the Toronto team, Williams averaged an astonishing 9.7 points per game – turning him into a notable and undeniably valuable key player. It was in December of 2003 when Williams was traded again to the Chicago Bulls, averaging 6.2 points and 7.0 rebounds per game from 2003-2004. During the offseason of 2004, Williams was traded yet again to the New York Knicks, but was waived by the team in 2005 as a result of the NBA’s new labor agreement – which prompted Williams to then announce a retirement from the court. 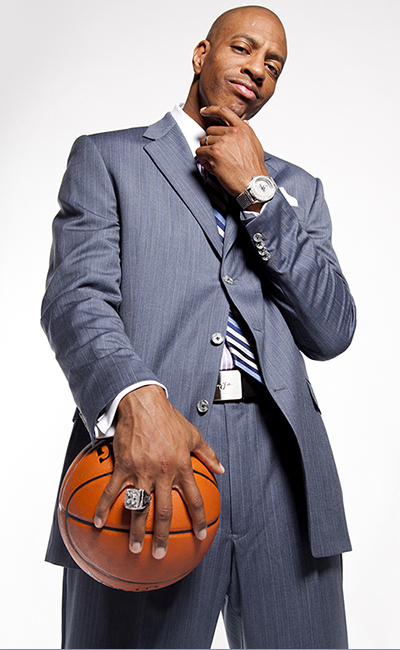 On January 25, 2006, he rejoined the Raptors as their community representative. His love for Toronto is unique and always reciprocated – as Jerome was always greeted by the city with a standing ovation whenever he’d return in Bulls or Knicks gear. During his nine seasons as an esteemed NBA player, Jerome Williams played in 587 games with an impressive average of 6.6 points and 6.4 rebounds per game. Williams became Director of Player Development for the Findlay Prep, basketball team before becoming Associate Head Coach, and then being promoted to Head Coach in the summer of 2013, continuing on until 2014. Apart from his regular on-court appearances; Williams is no stranger to making appearances on-screen, as well – having landed a cameo role in the 2003 Disney Channel Original Movie “Full-Court Miracle”, in addition to a small role in the Canadian FBI show, “Sue Thomas: F.B. Eye”. A charitable man and Global Ambassador; Williams joined the NBA’s “Basketball Without Borders” program which aimed to teach the game of basketball as well as bring resources to underdeveloped areas in Africa, South America and Asia, among other places. Jerome once said; "When you teach kids, you want to make sure they do things they love to do. When you get that fulfillment in life, it automatically makes you a more joyful person”. Jerome “Junk Yard Dog” Williams has contributed an accumulative 2 years (730 days) of community service time to the game of basketball. 2015 – Started up Shooting for Peace Programswhich raised $1.9 Million in Scholarships form HBCU’s for high school students. The program is currently servicing over 35,000 students in the USA and is ongoing. 1995 – Lead Big East Conference in Rebounding & All Conf.